Flickr is a good source of photographs that have been licensed under Creative Commons. Images licensed under Creative Commons are still subject to copyright, but the creator or copyright owner has chosen to allow other people to use their material under certain conditions. Depending on which licence is attached, Creative Commons images can be freely used in teaching material, as part of research publications, on blogs, wikis and other websites, in University publications and in MOOCs. Not all photographs on Flickr are available under a Creative Commons licence, so this guide explains how to limit your search to Creative Commons material. Go to the Advanced Search page on Flickr - http://www.flickr.com/search/advanced/. Navigate to the ‘Any license’ drop-down menu and select ‘All creative commons’ to search for all Creative Commons licensed images. 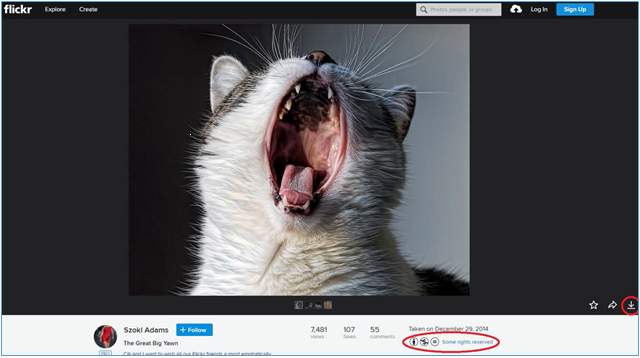 If required, you can also further limit your search to images that can be used commercially (such as for use in MOOCs) or images that can be modified or adapted. Navigate to the Search bar at the top of the page, enter your search terms then click on ‘Search photos’. On the search results page, browse the images for one that you would like to use. Below the image, you will see icons for the Creative Commons Licence and the phrase “Some rights reserved”. Attribution – You must attribute the image as specified by the photographer. If nothing is specified then a proper citation should be given. No Derivative Works – You may only use the image as it appears. You may not alter, modify or change the image in any way. Non-Commercial – The image cannot be used for commercial purposes. Share Alike – If you modify or build upon the image, then you must licence the new images under the same licence as the original image. Click on the ‘Download’ icon in the bottom right-hand corner of the page to download a copy of the image. You will have the option to select the image size that you would like. Make a note of the title, the photographer’s name and the URL for the image so that you can attribute it correctly. All Creative Commons licences require that you attribute the images that you use. There are specific requirements regarding the attribution of copyright material - your citation should include the title of the work, name of the creator, a link to the website where the image is hosted and the type of Creative Commons licence applicable to the work. If the creator has requested that they are attributed in a particular way you should try and follow their request. If you are using the image in print or digitally without hyperlinks, your attribution should include the text of the URLs. If you would like to use a specific citation style then please see re:cite (http://library.unimelb.edu.au/recite), the Library’s citation guide. A PDF version of this guide is available for download.